Easy Divers Cyprus, We are only 45 minutes from Larnaca airport in the south East of Cyprus. Our dive centre can be found at the entrance to the main resort of Protaras. We are opposite the Sphinx Egyptian bar/Near Mcdonald’s Burger Bar, at the main set of traffic lights on the main Protara Kavo Grecko road between Paralimni and Cape Grecko peninsular. Easy Divers Cyprus, we are a padi diving services company, that has English/Cypriot ownership operating on the south-east coast of Cyprus. We can Speak your language English, Greek, Swedish, Finnish, Polish and Russian. Our main priority is safety and to ensure that all divers, from beginners to professionals, enjoy their underwater adventure with safety and high quality customer service. Dont let prices put you off diving. Remember you always pay for what you get, that’s why you can expect the best service.We are known for a personal attention to all our guests. This is how we have achieved one of the highest Padi Dive Centre ratings and reviews. We are proud to be a Padi Five Star Instructor Development Centre with our own Padi Course Director. This rating, you can be sure you have the best Experience, Equipment and Education in the area. Our dive centre has received many Certificates of Excellence, from Padi and satisfied diving customers. Our centres are and will be subject to regular spot checks, ensuring that quality control is continued throughout. We also have a highly-qualified IMCA Dive Technician, who helps maintain, service all our dive equipment, compressors and keeps it all up to date with strict maintenance procedure. We want to ensure that you enjoy your underwater adventure, content in the knowledge that all reasonable care has been taken to ensure your safety with both our scuba instructors and the quality of our dive equipment. Easy Divers Cyprus, features first class service, professional scuba instruction, and all-inclusive diver services. We service and equipment new and second hand dive kit for sale at our dive centre. Easy Divers Cyprus is a PADI 5-Star Instructor Development Centre. About us 2006 we began to changing our diving policies for a more safer diving. Our FREE NITROX begin in January 2007. We have already got many favourable comments on the safety, from our divers and an exceptional amount of votes for our FREE use of dive computers. High Standards, There is no greater priority than creating safe and responsible new divers. I hope that by setting such presidents, other Diving Centres in Cyprus will follow suit with a temporary offer of Free Nitrox. Please request you’re Free Nitrox and Free SUUNTO Diving Computer use with the dive schools you plan your dives. Be a SAFE DIVER! PADI Five Star Instructor Development Centres meet all PADI Five Star Dive Center standards and provides the Instructor level of service. The goes above and beyond other Padi Dive Center. 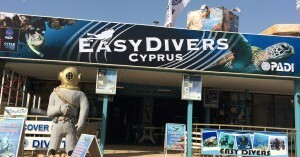 About us: Easy Divers Cyprus, we are only 45 minutes from Larnaca airport in the south East of Cyprus. Cyprus’s first and only Dive Centre which offers “Nitrox for free! “FREE NITROX AND USE OUR DIVE COMPUTER TO ALL OUR DIVERS. Find a Dive Centre that will offer you this service. We have a great dive team that includes dive masters, instructors and padi course director. We go far beyond others in the area. Our Years of Experience is the longest you will find in Cyprus. We teach students and instructor level courses for both Recreational and Technical Diving. Our Dive Team are highly talented and experienced in local and Zenobia Wreck Diving. Technical Diving. Technical diving is scuba diving’s “extreme” sport, taking experienced and qualified divers far deeper than in mainstream recreational diving. Our Technical Diving Instructor will take you beyond your basic skills required just to pass the TecRec Course. Our Tecrec Technical Instructor will show your from their own experience what works best! We don’t just repair and fix recreational dive equipment, our commercial IMCA dive technical will repair a simple regulator to a saturation diving chamber. Need some dive gear fixing? Maybe you just want an annual service on your scuba gear? We can take excellent care of your scuba equipment. We have our own dedicated shop area and certified technicians, servicing equipment like Aqualung, APEX, ScubaPro, Oceanic, MARES, Aeris, Hollis, Sherwood, Poseidon, Genesis, and many more. We touch the lives of others in ways we often never know. People sometimes come into our personal world for fleeting moments and can leave us forever changed. Padi Course Directors teach PADI Instructor Development Courses (IDCs) and other instructor-level training, and thus are the scuba diving industry’s most influential leaders and role models. This rating is the highest and most respected professional rating in recreational scuba diving. PADI Five Star Instructor Development Centers (Five Star IDCs) are dive centers that meet all PADI Five Star Dive Center standards, plus offer PADI instructor-level training. Five Star IDCs have at least one PADI Course Director on staff and are committed to offering PADI Instructor Development Courses and continuing education opportunities to dive professionals. These businesses excel in using the PADI System of diver education to introduce people to scuba diving, and then provide the continuing education that allows individuals to progress on to the dive professional level. If your goal is to become a PADI Scuba Instructor, find a PADI Five Star IDC to start earning the world’s most recognized and desired professional scuba rating. Let Easy Divers show you around some of the best dive sites. Some of the most beautiful dive site in the scenic Cape Grecko area one of Cyprus hidden wonders. There are so many destinations to travel to, and so many sites to dive. So how can you find the best places to experience the magic and tranquillity of the underwater world? Additionally, to find which sites are rated the highest by other divers, in and around Cyprus. Every scuba diver of all levels can enjoy the magnificent diving and clear blue Mediterranean waters has to offer. The best dive sites for beginners are around green bay and de costa bay. More experienced divers may dive the caves experienced divers may dive the caves or cyclops dive site. If you love wreck diving, local wrecks like the Liberty and the Nemesis will be your taste. The Zenobia Wreck Located in Larnaca is Top 4th Wreck in the world and not to be missed! !